Don't go to a chain store with school aged clerks who are part time without professional training to guide you in the selection process of your new or replacement garage door. We will help you make a selection that provides the security, insulation, and sound limiting you want. 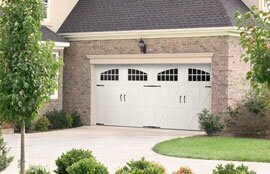 A great way to enhance your property's curb appeal can come from your garage door. Locally owned and operated, Prince William Garage Door has the technical knowledge and experience to properly install any garage door or replacement parts. Our customers tell us our customer service stands out from several other providers they called before finding us. We will come to your property to inspect the need and provide a demonstration of a variety of doors to select from depending on your budget and quality needs. Visit us at our showroom and see for yourself why we have been serving the Northern Virginia area with a strong referral rate from our satisfied customers for so many years. We sell only the best quality door control products at some of the best prices you will find. We have faith that our personal service and professional installation will keep us in your address book to refer to friends and family. We will ensure you get the best value for your money. The beauty comes naturally! Proper installation is key to avoid near and long term problems with your garage door control products. Doors become unbalanced causing springs and chains to break. This also creates unnecessary strain on the motor typically resulting in motors burning out long before their time. Call us and we will make sure your door is properly installed for operation, safety and security. To maintain the highest of standards, our door installers are professionally trained by product including the various styles of doors (Single - Double - Triple, or whatever your needs are), keypads, for keyless and remote entry, broken chain replacement and so much more. You've found the solution for your Garage Door Needs - Never be locked out again! We service business garage door and residential homes needs from new installations, replacements and general service to replace springs, remote controls and openers. Builders often seek our expertise on some of their highest caliber homes for the unique custom options we can provide. The products we sell are as beautiful as they are durable with high value installation. Select the style that suits your liking and get a professional installation by our trained technicians. Our customers come from throughout the Fairfax County Virginia area including, Fairfax City, Centreville, Chantilly, Oakton, Herndon, Burke, Vienna, Resont, Springfield, McLean, Tyson's Corner, Dulles, Merrifield, Oakton, Baileys Crossroads and all surrounding areas.